GB: Has the questing system undergone any changes? If so, how is it different? Tara: We've made major changes to the guts of the system to allow for the new Multiplayer Save feature. This allows you to save your quest progress in a multiplayer game. Every time you exit a multiplayer session, not just your character is saved your journal is saved as well. So the next time you come back, the trapper will remember that you already killed that bear for him, and not force you to repeat the same quest again. This makes it even easier to set up a weekly Dungeon Siege session with your buddies to fight your way through to the end. GB: How many hours of gameplay are you looking to add to the original game, accounting for all side quests? Tara: We've created about fifteen to twenty hours of core gameplay. For those people that want to explore everything, open every crate and clear every corner of the map it could run up a bit longer. We've hidden some of our new Treasure Set pieces in some hard to find places, so it's definitely worth your while to be thorough! GB: Tell us a bit about the new pack animal that "will defend the player's treasure to the death." What advantages/disadvantages will this new animal have compared to the original packmule? Tara: The new pack animal is much more aggressive than the packmule. It willingly joins the fray by your side. GB: What are the strengths and weaknesses of the new Half-Giant player character? Will NPCs regard this new class differently than they did the farm boy or farm girl? Tara: The Half-Giant who joins you in single player is primarily a melee fighter. But I sometimes have fun taking this big, strong behemoth and making him my Nature Mage. You're not tied to any pre-conceived notions about the characters in Dungeon Siege. There are several quests that revolve around the Half-Giants on the Island, as well. GB: High-tech weapons in Dungeon Siege were few, but items like the Dragon Machine Gun added a futuristic kick to the fantasy world. Do you have any plans to add similar items in the expansion? Can you tell us a little about one of your favorites? Tara: The focus for the expansion has been on creating new items that tie in to the Island. The Island is covered by Jungle in large areas, so you'll find many weapons or armor pieces that relate to this, for example, you can find Cured Leaf Gloves for your archer. The peoples populating the Island are not advanced and don't currently have the technology level found by the goblins in Dungeon Siege. But there may be some more high-tech items found in some of the ruins. GB: The new ease-of-use features such as the auto-aim and auto-health sound fantastic. Have you learned much from mod-makers while concentrating on the expansion? If so, what have you learned and perhaps taken from the community and added to LoA? Tara: The modding community has been really supportive of our effort and a lot of the changes we've made are derived directly from things that they've said they want to see in Dungeon Siege. One thing they asked for was more armor and weapons for ranged and magic characters to make it more comparable to the multitude available for melee characters. We have responded and even created some cool new things for melee characters. 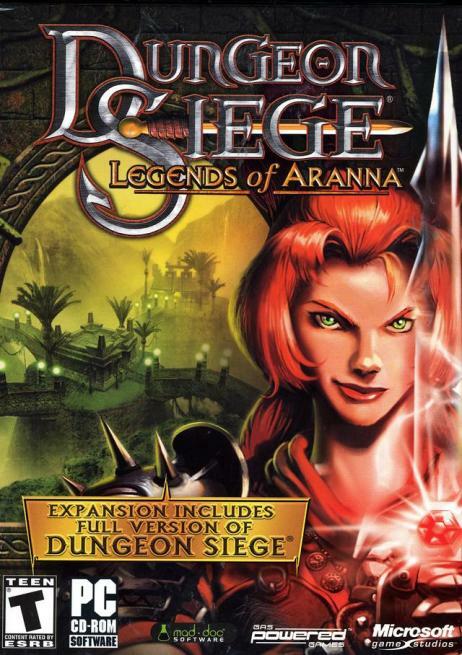 The game has a lot of unique new spells, terrain, monsters and equipment that add new wrinkles to Dungeon Siege game play. The auto-sell feature came directly from requests from the community. We'd like to issue a sincere thank you to Microsoft, Gas Powered Games, and Mad Doc Software (especially Tara!) for making this interview possible!